I was a bad boy and played hookey from work for parts unknown the other day. Just hitting the gun shops and pawn shops out of my immediate area to see if I can get into trouble. I was about head home when I went into a pawn shop and saw this BHP hiding on the bottom shelf. It had a $575 price tag on it. I asked to see it and it was like new and I think $575 is a great price for a MK III. But because it was a pawn shop I asked if he could do a bit better and replied with "Make an offer and the computer will tell me if we will accept." So I told him to tell the computer I'll give offer $500. The computer then told the pawn shop owner who then told me yes, $500 will work. 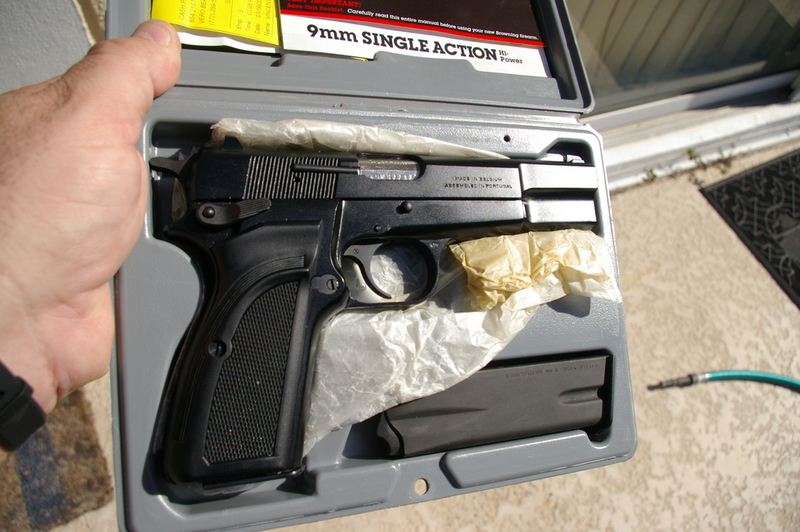 I had a few T series and C series BHP's that I sold, but I do have a MKIII Practical and an interesting Israeli 1950's MKI that was rebuilt with a MKIII slide and barrel minus the firing pin safety. So I needed another BHP like a hole in the head, but this one is really nice and is from 1993. Congratulations, you did good! Let us know how it shoots. This Mark III was originally an Israeli Police turn in. It was kinda beat up looking when I got it, but internally it was in very good shape. I ordered Novak sights (gold bead front, and super wide notch rear) and sent it and the sights to the late Arnold Dew to check it out, refinish it, and install the sights. I never owned one before, but I'm glad I grabbed this one, and I'm happy with the results. I didn't know much about P-35s before this, but I'm told the late 90s Mk III is a good one to have and shoot. Yours looks good and you got it right! Nice. Great looking hi powers. Still classy and very functional. When I started in LE we were issued S&W Model 15's. Most carried revolvers. If someone carried a semi-auto it was either a 1911 or Browning High Power. Two most prevalent autos of the day. Did not like the 9mm back then as ammo selections just did not exist. But the 9mm is back as the selection is great and the improvements in ammo over the years make the 9mm a serious fighting caliber. Even the FBI went back to the 9mm from the .40 a year or so ago.